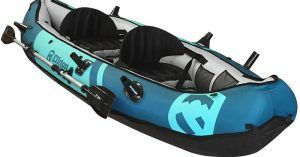 What is the best inflatable fishing kayak? 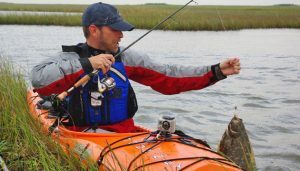 Do you know the best inflatable fishing kayak for your crew of anglers? Within this article, you’ll find the information you need to make the best purchase, no matter the size of your fishing crew or your kayaking skill level. Both experienced and novice anglers can have fun fishing from an inflatable kayak. These well-constructed vessels make it easy to get on the water and head out to the best fishing holes. 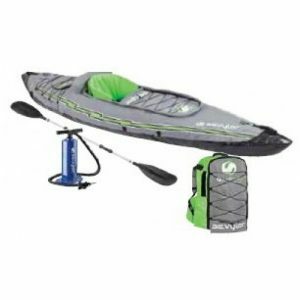 The best inflatable fishing kayak will provide you with plenty stability, the right weight capacity, and easy storage at the end of the day. How Good Are Inflatable Kayaks? Does this mean you’ll never get wet in an inflatable kayak? No, but you will get on the water faster and learn to manage your kayak more quickly in an inflatable than you can in a hardshell. Your kayak style will obviously depend on the number of people you’re taking with you, the size and weight of those people, and how much gear you want to take. While a rod rack is a handy tool on your kayak, managing the weight tolerance is critical; a 300 pound capacity kayak with 295 pounds of paddlers doesn’t allow for much gear! 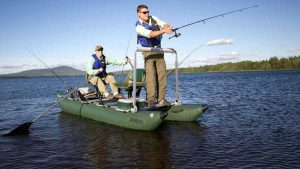 Sit-On-Top Fishing Kayak is a great option for those fishing in warmer climates. It’s easy to get off and back on these models, and they have scupper holes to reduce the need to bail if you flip. Be aware that you will get wet as you paddle your inflatable sit on kayak. Sit-Inside Fishing Kayak keeps more of your body out of the wind and is a cozier choice when fishing in cool climates. Rolling in a sit-inside makes recovery more of a challenge; your boat will likely be waterlogged when you roll it back. How Many Anglers Are You Carrying? Your fishing team will determine the size of kayak you need. Be aware that a tandem kayak can be handled alone, but it take some expertise to keep a tandem moving efficiently on your own. Whether you invest in a 1 person, 2 person, or 3 person inflatable kayak, keep an eye on the weight capacity and put your strongest paddler in the back! Depending on the number of anglers you’re carrying, your inflatable kayak can run from 9 to 12 feet long. The weight will probably not exceed 50 pounds, even at the largest capacity. Inflatable kayaks offer great stability for beginners. Your speed will be impacted by the strength and experience of your crew, but fishing isn’t a race! Inflatable kayaks offer terrific durability for the money and make getting on the water a simple process. Many inflatables have a reinforced hull that protects from hitting submerged objects. One common issue of even the most durable inflatable kayak options is that the seats can spring leaks and lose air. Keep an eye on them and be ready to patch if necessary! The best inflatable fishing kayak is always going to be the one that fits your needs the closest. Most sport-fishing is done on large lakes or slow moving rivers. All you need is enough room for gear. Look for the stability you need to reel-in that dream-catch. This inflatable angler kayak by Saturn is perfect for fishing in slow moving currents. It features a Dtex high-strength PVC coated fabric that’s virtually puncture-proof. It’s most comfortable for a single occupant, but it can support up to two passengers. Saturn’s 13 foot kayak works great for any fishing enthusiast who spends most of their time on the lake. You can use it standing, or sitting when you want to take a break. A plethora of customized accessories are available for this model too. You can add seating, sunshades, and extra safety options. If you enjoy fishing yourself without any distractions, a Saturn might be the right choice for you. A lone-angler who wants a lot of value for the investment will enjoy this model. Ease-of-use makes it one of the best inflatable fishing kayaks on the market today. 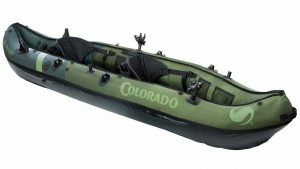 Sevylor’s Coleman Colorado is a good inflatable tandem fishing kayak. You get so many cool features it’s easy to see why this has become such a popular choice. Adding an electric trolling motor will make the Colorado shine in comparison to other brands. It’s not extremely easy to row, but it is quite comfortable. This model is best suited for a quiet lake-setting. This model is a good choice for two-person fishing teams. You can take some time to relax while the built-in rod holders take care of your line for you. You can easily move along the water with the convenience of a small motor. Anyone who likes to sit in one spot while getting some quality-time with friends will appreciate the Colorado. It is the best inflatable kayak for fishing with a friend. An angler who wants to go fishing with a friend should check out this kayak. It’s one of the quietest movers out there. Advanced Elements went above and beyond when designing this vessel. It has reinforced aluminum ribs ensuring this model lasts through even the roughest waters. It is often ranked as one of the top inflatable kayaks around for its durability and versatility. You can convert the seating for a single rider, two occupants, or an open deck. Someone who wants to go fishing through rough waters will get the most out of the Advanced Elements Convertible. It fits well in any fishing situation. You can go out alone or with a friend. When you want to fish in still-waters, you can convert it to an open deck configuration for a smooth experience. You can even take it through rapids on those days you feel more adventurous. This is the best inflatable kayak for an angler with a taste for adventure. You can use it for fishing with a friend one day, and take it out on the rapids tomorrow. 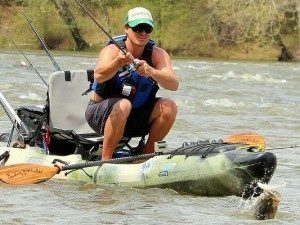 The Straitedge is a durable inflatable kayak designed specifically for anglers and fly-fishing. A wide-beam construction offers exceptional balance for casting your line while standing. It has two rod holders, and it has plenty of room for all your fishing gear. You even get the advantage of having a removable mounting rail in the front. It also has built-in paddle holders. This model is perfect for advanced fishing enthusiasts. A removable mount makes adding essential equipment easy. You can mount your fish-finder, aftermarket rail mounts, and extra rod holders. You’ll have more than enough space for tackle and fishing accessories. The greatest part of this inflatable fishing kayak is the extra-wide construction. It is effortless to balance yourself when reeling in a big catch. If you take your fishing days seriously, you’ll be a good fit for the Straitedge. You can equip this model with all of your advanced fishing gadgets, and have tons of storage space to load all your gear. 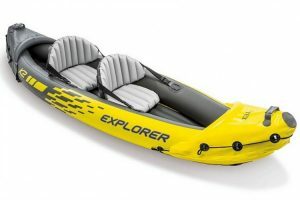 Intex’s Explorer is a good inflatable kayak for those who only occasionally fish. It is compact and easy to inflate. This package comes with two aluminum oars and a pump. You’ll have everything you need to get out on the lake. This inflatable kayak works best when two people paddle together. The Explorer is intended for general use on calm waters. It is not designed as a fishing-vessel, but it is a quality inflatable kayak. The explorer moves easily on the water, and has plenty space for fishing gear for a single occupant. It gets the job done without all the fancy features of higher-end models. The only downside is you don’t have much stability when standing on this inflatable kayak. Intex’s Explorer is a great entry-level vessel for the average fishing enthusiast. You don’t get all the top-level features other models have, but you’ll definitely have a fun day fishing on your local lake. Sevylor’s Big Basin is probably the best 3 person kayak you’ll find. It is reliable on the lake, and can even tackle some whitewater rapids. It isn’t specifically outfitted for fishing, but it has more than enough stability for any angler. You also get a decent amount of space for fishing gear and all three seats are adjustable to suit your comfort needs. This 3 seater inflatable kayak is a good fit for any fishing team. You can take your buddies out exploring new fishing spots with ease. 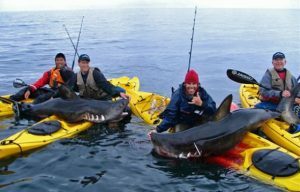 If you are lucky enough to hook a big fish, you won’t have any problem with your kayak tipping over. There aren’t any rod holders, or mounting brackets but you don’t necessarily need those to have a great fishing experience with the Big Basin. The Big Basin is a perfect option for someone who needs lots of room on their vessel. It can even handle mild rapids and swift rivers. That makes this model ideal for scouting out new fishing spots. The Quikpak K5 is the best one person inflatable kayak for hikers. The K5 folds into an included carrying backpack. This makes it simple to bypass sections of rivers you don’t want to kayak through. The easy transportation of the K5 means you can take it virtually anywhere you want. You can shove off from any position on a river or lake. This model performs well through mild rapids. It includes storage compartments where you can store fishing and camping gear. This model is honestly suited for someone who plans to go on fishing trips for days at a time. You can explore nature on-foot without leaving your vessel behind on the shore. 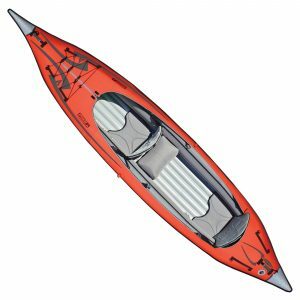 Sevylor’s Quikpak K5 is the best single person inflatable kayak for fishing off the beaten path. Are you an angler that loves to make your fishing trip into a several-day vacation? This vessel is right one for you. You can take it anywhere with its convenient backpack storage. 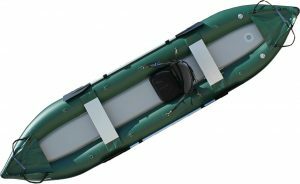 This inflatable double kayak by Sea Eagle is capable of handling extreme conditions. You can easily maneuver through class III whitewater without being concerned about this sport inflatable’s reliability. This vessel is exceptionally well-made, and includes everything you need to get started. You’ll get two paddles, a pump, and two inflatable seats. It isn’t designed specifically for fishing, but you shouldn’t have any problem storing your gear as it has lots of room. You may even be able to fit a third passenger on board. Anyone who loves to fish in rivers will enjoy the maneuverability of this Sea Eagle and it has decent balancing for stand-up fishing. The seating is comfortable for long trips. The maximum weight capacity is over 600 pounds, so you don’t need to worry about overloading it. It is hard to puncture under normal conditions. 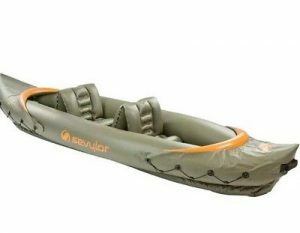 If you want to fish in a swift river with a friend, this inflatable tandem kayak will get the job done. It is durable and ideal for river fishing. Driftsun’s Voyager is a great 2 man inflatable kayak. The seats are completely removable. You can use it as a normal boat when fishing in calm waters. The included accessories are good-quality. The Voyager includes two paddles and a pump. It will do everything you want on the lake, but it isn’t suitable for rivers. The voyager is surprisingly great at keeping balance when you are standing. A beginner angler will have a blast on the Voyager. You can stand and cast your rod with ease. It has enough room for a friend, and enough space for your fishing gear. It performs best along the shoreline in small bodies of water. A professional-looking design adds style to your angler accessories without breaking your budget. This model would be flawless if it had rod holders and a trolling motor mount. The Voyager works fine for drifting along the lake-shore with a friend. 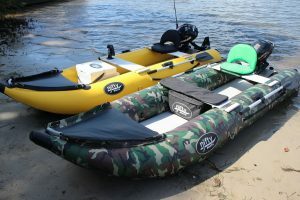 It is a good entry-level inflatable tandem kayak for fishing. Sevylor’s Tahiti is a great inflatable hunting and fishing kayak. This model focuses all it’s attention on stability. It is nearly impossible to tip this vessel when moving around inside. That means you can move as much as you want when casting or reeling in. This is the best 2 person inflatable kayak for anglers who don’t carry much gear with them. This model handles exceptionally well on large rivers. You’ll get a lot of balance when standing and fishing. The Tahiti tends to travel in a straight line which cuts down on the amount of spin you’ll encounter when fishing in a slow moving body of water. Sevylor’s Tahiti is ideal for large rivers. It’s a great two person inflatable for slow moving water. Most fishing enthusiasts have similar concerns when selecting a new inflatable kayak. Pay close attention to the durability rating of the inflatable kayak you are considering. If you intend on fishing in rough waters, you should make sure your choice can handle the environment. Technology has improved drastically over the years for compact vessels. There isn’t much an inflatable can’t handle. Just keep in mind a narrow vessel will perform better through rapids in comparison to wider models. Wide vessels focus more on balance than maneuverability. The main difference is a regular kayak is non-collapsible. Regular models tend to be more suited for dangerous waters as a sporting-vessel. Inflatables are usually easy to transport, lightweight, and well-balanced. 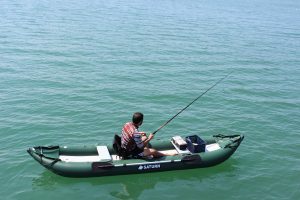 What is the best inflatable kayak for fishing? Saturn’s 13 foot-long fishing kayak is our choice for the best inflatable fishing kayak. It features great stability with a high-durability rating. You’ll have more than enough storage space for fishing supplies. You can also take a friend along on your next trip to the lake. You can easily stand and cast your line. The construction is well designed and the material is virtually indestructible under normal conditions. You can also add a ton of aftermarket options. It’s very reliable on the lake, and does a decent job navigating through slow rivers. You can do everything with this model that you can do with a standard boat. It doesn’t get much better than this for your average inflatable kayak and there aren’t any major downsides. An overall balance of performance and comfort make this our top pick. The Saturn 13′ Fishing Inflatable Kayak is the ideal choice for any angler who wants a satisfying fishing experience. Check out these other great options we’ve gone over. You’re sure to find a few features you like.